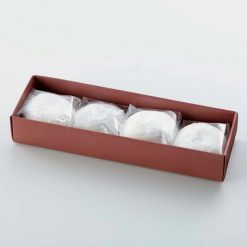 Shio Daifuku, a delicately sweet rice cake with a salty hint added to both the outer dough and the inner bean paste. Very easy to prepare and eat. Package contains 4 individual pieces (55g each), totalling 220g. 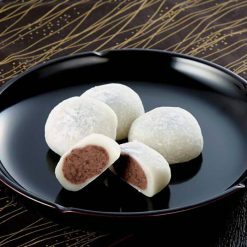 Daifuku is a traditional Japanese sweets that consist of mochi dough with sweet red bean paste inside. The salt added in both dough and bean paste gives a good savoriness. It is a Daifuku with a delicate sweetness. The perfect balance between the silky smooth dough, flavorful chunky redbean paste, and the salt to bring out the natural taste of each ingredient. Azuki red beans are good source of protein and Vitamin B1. As Vitamin B1 is essential in breaking down the carbohydrates, the combination of rice or rice cake and Azuki beans are often the base for the many of traditional Japanese sweets and works well for the body as well as the taste. Azuki red beans are also the source of Vitamin B2, niacin, calcium, phosphorus and iron, and said to reduce the symptoms of low blood pressure, beriberi, hangover, fatigue, muscle pain, stiff neck, etc. Thaw out as is in individual package at room temperature for 2 to 3 hours before serving.Once thawed at room temperature, please enjoy them the same day. Please do not thaw in refrigerator or re-freeze as it may harden the dough and compromise the overall quality of the product.If they have become dry or hardened on the outside, heating on a grill will make the outer mochi dough softer or a little bit of crisp will give this treat a toasty flavor. This product contains dough (rice flour, sugar, starch (potatoes, corn, wheat), salt, enzyme (derived from soy)), Redbean paste (red beans, sugar, syrup, salt). Origin of ingredients: Glutinous rice (domestic), red bean (Hokkaido). Prepared and packaged in Japan.